From backyard getaways to commercial paradises, we have the experience and talent to complete your swimming pool or spa project in a comprehensive and cost-effective manner. By getting to know each and every client personally, we’re able to provide an experience crafted just for you. We guarantee that your unique needs will guide every decision we make. We’ve mastered the complicated process of commercial pool construction, from the initial design to final inspection. With over 25 years of experience building custom pools, we offer countless options for your backyard vacation spot. Contact us to replace your pool liner and breathe new life into your backyard oasis! 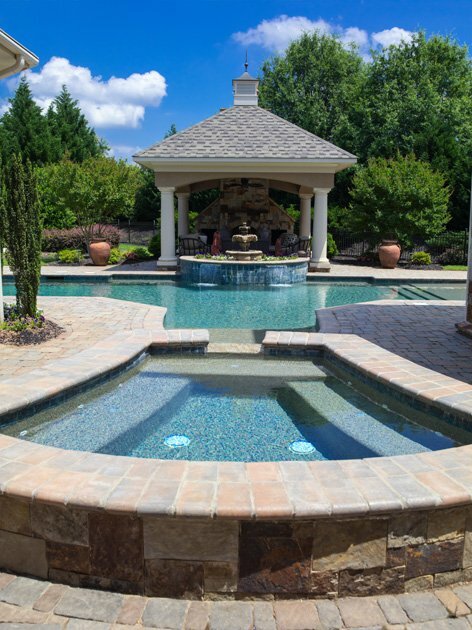 Based in scenic Upstate South Carolina, Genco Pools & Spas has been building and servicing pools and spas in the Greenville/ Spartanburg area for over twenty years. As part of our mission to build meaningful and lasting relationships with our customers — and the community as a whole — we regularly give back through support of local schools, participation in charitable events, and donations to local causes. Genco sends out an e-newsletter with helpful pool tips, special coupons, and more. You have given us, and continue to give us, excellent service on all aspects of our pool! I love that you are always available to help at all times. Everyone is very attentive and pleasant to work with. I always feel that my problem is a priority. The service is awesome all the way around! Our experience was fantastic, and your team has been amazing! Even when the project had issues, your team was very informative and went beyond the circumstances to make the experience pleasant. Great service! Every crew you sent through were top notch, professional, kind and courteous. We are very pleased with how things turned out, and we are looking forward to a full season of pool party fun — actually, many years of family fun by the pool. Glad we found Genco! We are very happy that we chose Genco. The quality of workmanship and the professionalism of staff was amazing. We plan to recommend Genco to all our friends.